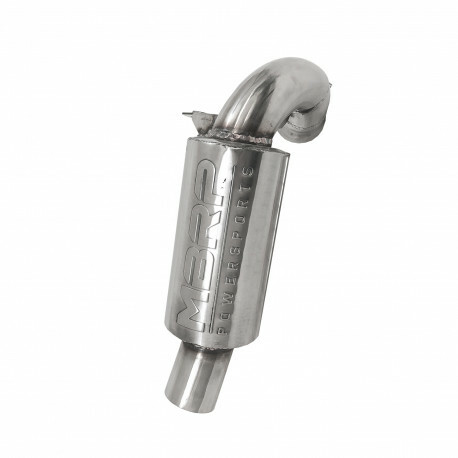 MBRP's Race Exhaust - designed with maximum performance and sound in mind for your Ski-doo 900ACE Turbo. Aggressive sound, recommended for racing or off-trail riding. Questions? Call us 1-888-636-7223.
would be the best way to describe MBRP products. Pair that with industry leading R&D and a customer service team, MBRP is not just an exhaust company, it’s a culture. Featured services: Manufacturer and distributor of Aftermarket Performance Exhaust, which includes several market segments; Gas and diesel light trucks, late-model muscle car, Sport compact, Euro, Jeep, snowmobile, ATV & SXS applications. Is there a particular product that launched MBRP off the ground? The B&B Eliminator, the original snowmobile muffler, started it all and then we helped bring diesel trucks into the enthusiast arena, playing a large role in where we’ve branched into today with so many other automotive applications. What makes your company better or different from others? Our level of testing and our dependability both in customer service and product; our knowledge and experience in house to develop products, testing in real world environments and using the test results through the R&D Process – allows us to build a killer product. We then follow it up with outstanding customer service. What product are you most proud about? Almost 25 years in the snowmobile industry and in the past 8, further branching into Powersports with SXS and ATV. But more important than our products, is our team. We couldn’t ask for a better group to work with day-in & day-out, over 110 team members – its safe to say our team is what we are most proud of. MBRP is the official exhaust of CSRA. Why did MBRP get into Snocross Racing? Our Powersports Brand Manager, a previous racer himself – works closely with race teams to give our products the edge and truly back up what we claim, if they’re proven to perform on the track - they’re going to hold up in all riding conditions. What is something you are sure to find inside your employee breakroom? Industry magazines & MBRP branded swag – we have a team of enthusiasts who are proud of the products they build.